The bottles on the trees at McCurdy Farms in Hood River are not a form of public art — although they are quite beautiful. 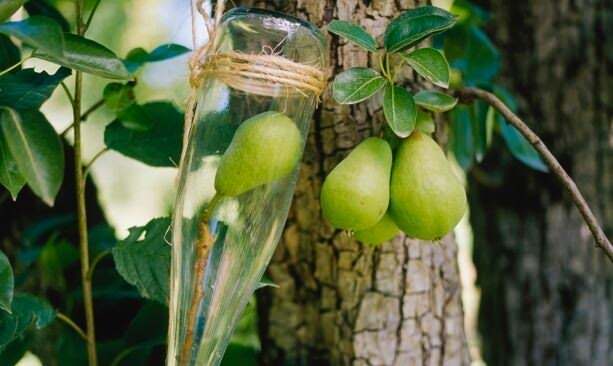 Each spring, right after the blossoms fall in April or May, the bottles are tied with twine onto the orchard’s largest pears, called the King Pears. That’s when Clear Creek Distillery’s pear brandy begins its five-month journey from branch to bottle. 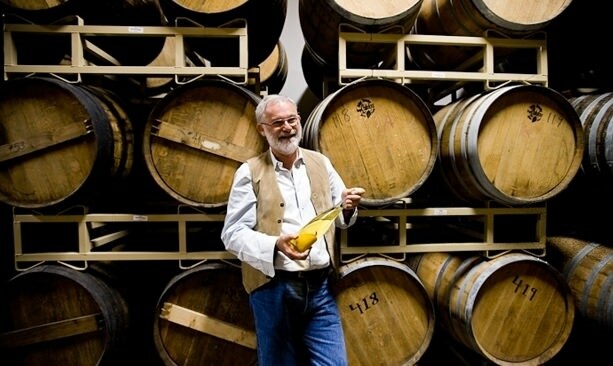 Since Clear Creek’s launch in 1985 by founder Steve McCarthy, pear brandy has been the flagship product of their 24 fruit-based spirits, all of which come from Oregon and the Pacific Northwest — many from the Columbia River Gorge. Each of their spirits — from Doug fir brandy to marionberry liqueur — are produced in traditional European pot stills with techniques learned in Alsace, France and Switzerland. In 2016 the bottles underwent a design change, for a more updated, cohesive look. The distillery continues to receive national recognition, with nine nominations for a James Beard Award in the past 10 years, including in 2017. But how exactly do those bottles on a branch turn into such a fine product? Bartlett pears are fragile, vulnerable to damage by the elements. The Clear Creek crew makes sure to face them on a slope, to drain the rainwater. Those facing the sun get outfitted with a paper wine sleeve called a “bonnet” to prevent burning. 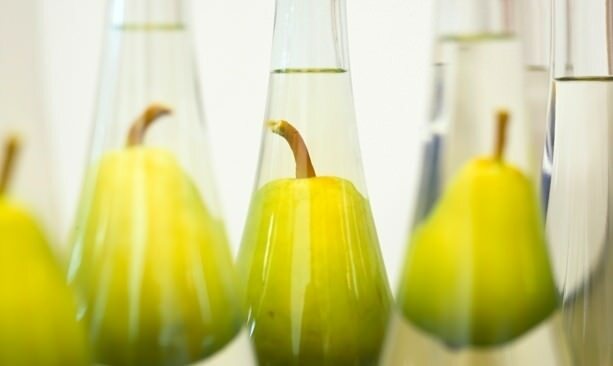 The pears grow into the bottle until harvest time in July or August, when they’re collected and brought to the distillery in Portland for processing. They get filled with water to loosen the dirt, soaked overnight and then scrubbed by hand with bottle brushes. Then they’re filled with pear brandy, corked and filtered if necessary. The pears that survive on the trees are harvested soon after the bottled pears, in late July or early August. Those pears are used for processing — it takes 20 pounds of perfectly ripe pears to make each bottle of brandy. About two months later, by October — five months from the start of their journey — they head out to stores, bars and restaurants throughout Oregon and around the county. This spring, visitors can taste and appreciate Clear Creek’s innovations along the Hood River County Fruit Loop at the Hood River Distillers Tasting Room, as well as at Clear Creek’s Northwest Portland tasting room and distillery, where tours are offered twice a day on Saturdays.